If 51% of America's population is female, then why are women so under-represented in our politics at every level? Why do women still get a fraction of pay for the same work when standing side-by-side with men at a job? Why are so few women in top leadership positions in business and other organizations? 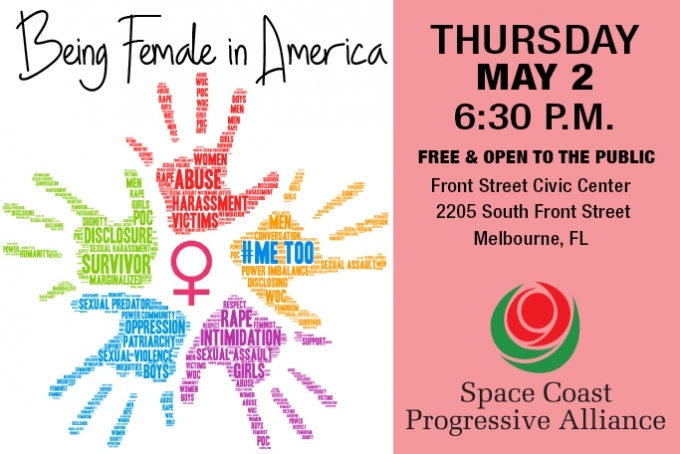 Please join us for an interactive discussion about what it means to be a female in America today. THURSDAY, MAY 2 / 6:30 P.M.
Julie Adams, proud feminist, high school student, public speaker and intern for local and state-level political campaigns. Suzy Anand Garfinkle, mother of 3 amazing adult daughters, loves sharing Goddess Dance and Empowerment workshops, freelance writer/copy editor and founder of PrepareTomorrowsParents.org. Tess Martin, freelance writer and political strategist, director of the Common Ground Project and vice president of the Brevard Chapter of the ACLU. Vickey Mitchner, mother, disabled 14 year US Army combat veteran, Executive Director of Forever Our Home, Inc. and middle school social science teacher. Maddie Vroom, University of Florida PhD candidate conducting Space Biology research at the KSC Space Life Sciences Lab. In addition to playing an active role in many local STEM programs, she is a member of the Brevard Leadership Action Team affiliated with Planned Parenthood and the Young Ambassador for the state of Florida to the American Society for Microbiology. An interactive Q&A will follow the panel discussion.